Giant Cannonballs are very rare moving obstacles found in Super Mario Bros. 3, New Super Mario Bros. Wii, and New Super Mario Bros. U. They are much faster and bigger than the original Cannonballs, making them much harder to avoid. They always appear alongside (or in the same stage as) the smaller Cannonballs. 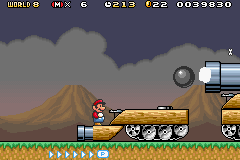 In Super Mario Bros. 3, they only appear in Dark Land's first Tank level and the Battleship level. The Cannons that fire the giant cannonballs resemble Warp Pipes, but they are colored black (blue in remakes) so as to not confuse the player. In New Super Mario Bros. Wii, they only appear in World 8's Airship. In New Super Mario Bros. U, they only appear in The Mighty Cannonship from Soda Jungle. Even though normal cannonballs are absent during New Super Luigi U, Giant Cannonballs reappear in the level Bowser Jr. Showdown. A Giant Cannonball in New Super Mario Bros. Wii. Giant Cannonballs reappear in Super Mario Maker and Super Mario Maker for Nintendo 3DS. The player can enlarge a normal Cannon with a Super Mushroom, which will enable it to fire Giant Cannonballs. The second official course created by Bowser, named Bowser's Cannonball Run, involves Mario running to keep a Giant Cannonball on-screen until the end. This page was last edited on January 13, 2019, at 04:11.